This replica of ancient rural Donegal will fill visitors with a sense of rich tradition. The village was designed and built by the local people of Glencolmcille in County Donegal. The Folk Village Museum comprises of a cluster of small cottages that replicate life in the 18th, 19th, and 20th century Donegal. Browse through the village at your own leisure or join a guided tour. You will leave the folk village with a hands-on view of how Donegal ancestors survived, how they developed rich traditions in music dance and crafts despite their short comings. There is also a fascinating craft shop and tearooms are also available. For a hearty Donegal welcome visit Glencolmcille Folk Village. Glenveagh National Park is one of six national parks in Ireland, encompassing some 16,000 acres in the heart of the Derryveagh Mountains. The Glenveagh Visitor Centre is located on the northern end of Lough Veagh, near the edge of the National Park. Its award-winning design incorporates a living heather roof mimicking the surrounding landscape causing minimum disturbance. The extensive displays contained within provide an introduction to the parks natural and built history as well as providing information on walking trails and events. Glenveagh Castle is rich in history and heritage, don’t miss this treasure of the Wild Atlantic Way. After hiking over the beautiful cliffs on Donegal you deserve a break. The Sliabh Liag Cultural Centre is the perfect place to stop off after a hike for a hearty bowl of soup or one of their famous bakes. The Cultural Centre hosts a coffee shop, a craft gallery and a tourist information centre. 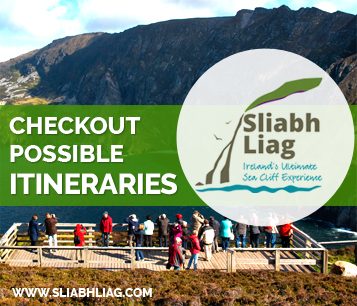 They provide information on the spectacular Sliabh Liag Cliffs and the surrounding area. Also they feature activities such as hill walking, archaeological tours and walks, archaeological education courses and weekend breaks. 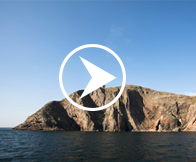 For all the information you need on Sliabh Liag and the surrounding area be sure to contact the Cultural Centre for more information.